Hamzeloo-Moghadam, M., Eslami Tehrani, B., Pirani, A., Hassanpour, A., Esmaeili, S. (2014). A survey about prophage induction ability in Escherichia coli K-12(λ) by ethnic medicinal plants of Kohgiluyeh va Boyerahmad, Iran. Research Journal of Pharmacognosy, 1(4), 7-10. M. Hamzeloo-Moghadam; B. Eslami Tehrani; A. Pirani; A. Hassanpour; S. Esmaeili. "A survey about prophage induction ability in Escherichia coli K-12(λ) by ethnic medicinal plants of Kohgiluyeh va Boyerahmad, Iran". 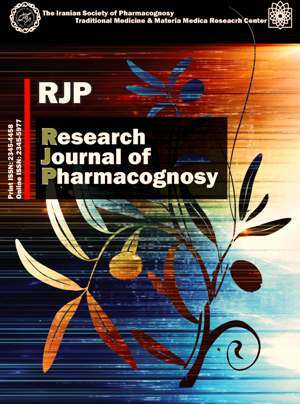 Research Journal of Pharmacognosy, 1, 4, 2014, 7-10. Hamzeloo-Moghadam, M., Eslami Tehrani, B., Pirani, A., Hassanpour, A., Esmaeili, S. (2014). 'A survey about prophage induction ability in Escherichia coli K-12(λ) by ethnic medicinal plants of Kohgiluyeh va Boyerahmad, Iran', Research Journal of Pharmacognosy, 1(4), pp. 7-10. Hamzeloo-Moghadam, M., Eslami Tehrani, B., Pirani, A., Hassanpour, A., Esmaeili, S. A survey about prophage induction ability in Escherichia coli K-12(λ) by ethnic medicinal plants of Kohgiluyeh va Boyerahmad, Iran. Research Journal of Pharmacognosy, 2014; 1(4): 7-10. 1Department of Traditional Pharmacy, School of Traditional Medicine, Shahid Beheshti University of Medical Sciences, Tehran, Iran. Traditional Medicine and Materia Medica Research Center, Shahid Beheshti University of Medical Sciences, Tehran, Iran. 2Traditional Medicine and Materia Medica Research Center, Shahid Beheshti University of Medical Sciences, Tehran, Iran. Background and objectives: There is a growing trend towards investigating natural products as sources of compounds with biological effects and many researches have been carried out in order to find effective medications against many diseases. Cancer is no exception and studies focusing on evaluating the effects of different materials on DNA, give valuable information in cancer researches and carcinogenicity studies; thus the present study was focused on evaluating the impact of medicinal plants from Kohgiluyeh va Boyerahmad province, Iran on DNA. Methods: Thirty five plant species collected have been investigated for prophage induction ability in Escherichia coli K-12(λ)throughinductest. Results:The assay demonstrated that 8 plants were able to affect DNA. Conclusion: The results confirm the role of natural resources for biologic effects and what’s more, potential drug candidates in new drug discovery. Walker GC. Mutagenesis and inducible responses to deoxyribonucleic acid damage in Escherichia coli. Microbiol Rev. 1984; 48 (1): 60-93. Mayer VW, Gabridge MG, Oswald EJ. Rapid plate test for evaluating phage induction capacity. Appl Microbiol. 1969; 18(4): 697-698. Elespuru RK, White RJ. Biochemical prophage induction assay: a rapid test for antitumor agents that interact with DNA. Cancer Res. 1983; 43: 2819-2830. Heinemann B. Prophage induction in lysogenic Escherichia coli with simple hydroxylamine and hydrazine compounds. Appl Microbiol. 1971; 21(4): 726-731. Heinemann B, Howard AJ. Induction of lambda-bacteriophage in Escherichia coli as a screening test for potential antitumor agents. Appl Microbiol.1964; 12(3): 234-239. Mosaddegh M, Esmaeili S, Naghibi F, Hamzeloo-Moghadam M, Haeri A, Pirani A, Moazzeni H. Ethnomedical survey and cytotoxic activity of medicinal plant extracts used in Kohgiluyeh and Boyerahmad province in Iran. J Herbs Spices Med Plants. 2012; 18(3): 211-221. Taghvaei M, Naghibi F, Mosaddegh M, Moazzami N, Ghorbani A, Fakhari A. Prophage induction in Escherichia Coli K12(λ) by some plants from Iran. Ethno Med. 2009; 3(1): 57-59. Mosaddegh M, Naghibia F, Moazzeni H, Pirani A, Esmaeili S. Ethnobotanical survey of herbal remedies traditionally used in Kohghiluyeh va Boyerahmad province of Iran. J Ethnopharmacol. 2012; 141: 80-95. Wang P, Su Z, Yuan W, Deng G, Li S. Phytochemical constituents and pharmacological activities of Eryngium L. (Apiaceae). Pharma Crops. 2012; 3: 99-120. Roscetti G, Franzese O, Comandini A, Bonmassar E. Cytotoxic activity of Hypericum perforatum L. on K562 erythroleukemic cells: differential effects between methanolic extract and hypericin. Phytother Res. 2004; 18(1): 66-72. Stavropoulos NE, Kim A, Nseyo UU, Tsimaris I, Chung TD, Miller TA, Redlak M, Nseyo UO, Skalkos D. Hypericum perforatum L. extract - novel photosensitizer against human bladder cancer cells. J Photochem Photobiol B. 2006; 84(1): 64-69.